Jens Byggmark -2-Fold Winner at the Ganslernhang Special race – an outstanding winner Kitzbühel Ski Club (K.S.C.) battled to prepare the slopes in the weeks preceding the Hahnenkamm Races. Snow had to be airlifted in from various depots and deposited on the racecourses. All efforts, however, proved to be in vain as just after the race courses were finished, hurricane Kyrill swept in on the night of January 19th and destroyed the Streif. Combined with debilitating warm rain, the race-ready slopes were simply blown away. The slalom slope, on the other hand, was in perfect condition, meaning that the cancelled slalom of Wengen could also be held in Kitzbühel. Right from the very outset, those responsible decided that it would not be feasible to hold the races on Mount Hausberg, so the piste teams concentrated on preparing the Hinterganslern course instead. The slalom course could not be set over the classic Ganslernhang slope, which meant that the speed disciplines and slalom would share the same finishing line. After Kyrill, all involved parties were devastated; all their efforts and the associated costs were in vain; the Streif was not fit to be raced on. There was, however, one small silver lining to this particular cloud, as the lower section of the course looked pretty good and had sufficient snow coverage. This rescued Sunday’s Hahnenkamm Slalom Race and FIS decided, without further ado, that the technical disciplines that had been cancelled in Wengen should now take place in Kitzbühel on the same day as the Downhill race, Saturday. The snow finally arrived. It blew a gale on Saturday and snowed, then the sky turned brilliant blue on Sunday. Fabulous weather meant that fantastic TV images were beamed around the world and a new star was born. Jens Byggmark, from the village of Tärnaby in Lapland, where the ski legends Ingemar Stenmark and Anja Pärson also grew up, was the new Kitzbühel Slalom King. Then aged 21 years old, he triumphed twice. Incidentally, Jean-Noel Augert was the only other person to achieve double slalom victory previously in 1971. Ingemark Stenmark won five times at the Ganslernhang in 1976, 1977, 1982, 1983 and 1984. The Swedish Ski Team finally had reason to celebrate! 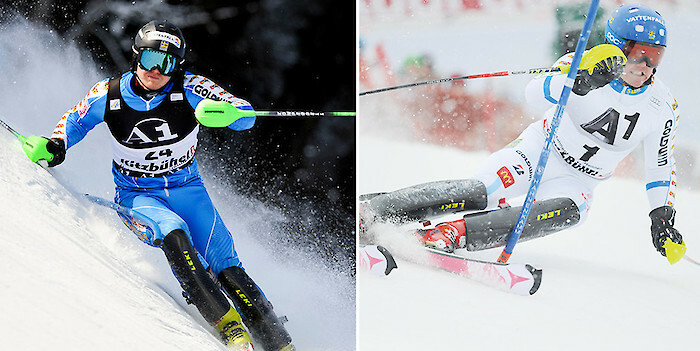 Mattias Hargin Surprises 25th January 2015 – a day for the old pros Before the Slalom race, a famous Austrian daily newspaper ran the headline, „Neureuther versus Hirscher: Cordoba on the Ganslernhang“. The French team were also keen to win and had prepared well to battle for the coveted trophy. However, as so often is the case, the one that everyone least expected ended up on the top of the winner’s podium, Sweden’s Mattias Hargin. He joined the start line for the race on the Ganslernhang for the first time in 2007 and was unable to qualify for the second run, while his teammate Byggmark triumphed with a double win. Hargin competed nine times in Kitzbühel, before finally winning on his tenth attempt. Mattias Hargin mastered the rock hard course with its many transitions, forcing his way ahead of his two fastest rivals in the second heat. Austrian Marcel Hirscher was openly impressed: „I have never seen such a good second run as the one Hargin delivered. He really went for it at every single gate“. The Swede was able to take the risk, as he was not under the same kind of pressure as the two race favourites. At last, he had the winning edge!